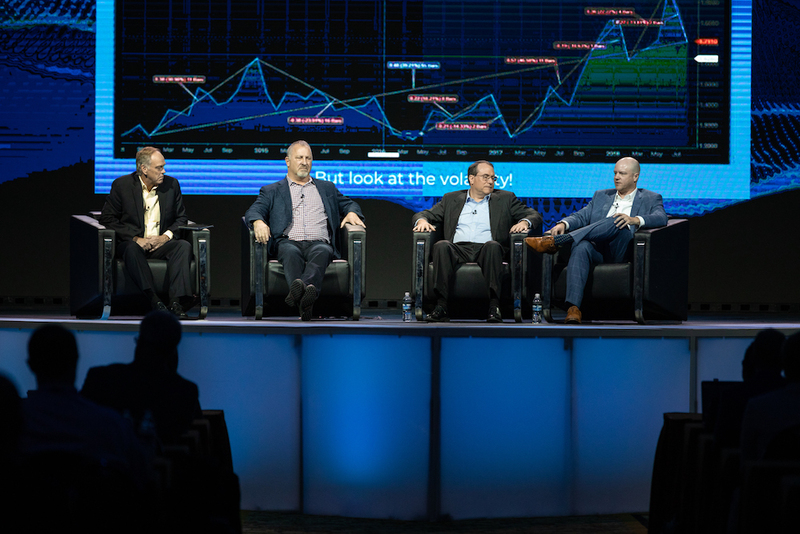 This morning at MarketWaves18 in Grapevine, Texas, FreightWaves executive editor John Kingston moderated a panel on freight futures that included Doug Waggoner, CEO of Echo Global Logistics (NASDAQ: ECHO), Paul Cusenza, CEO of Nodal Exchange, and Craig Fuller, FreightWaves CEO. The conversation focused on how shippers and carriers can mitigate price risk, the qualities of a successful futures exchange, and similarities and differences between trucking capacity and other commodities traded on futures exchanges. During the conversation, Fuller announced that the Freight Futures Exchange—in partnership with Nodal Exchange and DAT—would open on March 29, 2019. Fuller explained how he spent a few weeks at the Baltic Exchange in London studying futures exchanges and especially how cash-settled contracts were traded. “You need a large, volatile market, a benchmarked price index, a clearing house and exchange, and finally market data, news and commentary to provide information to traders,” Fuller said. “I’m comfortable saying that capacity behaves like a commodity,” Waggoner admitted. “Fifty-three foot trucks are fifty-three foot trucks. Trucking is pretty fungible to most shippers these days.” Waggoner said that the reason spot rates for trucking capacity are so volatile is because in transportation and logistics, supply and demand are inelastic. In other words, it is not the case that when trucking capacity is cheap, shippers increase production and move more freight, nor do they reduce freight volumes in response to high trucking prices. Waggoner outlined how brokerages can paradoxically make more money in rapidly deteriorating freight markets. Paul Cusenza introduced Nodal Exchange and summarized the similarities between electricity and trucking capacity. “We’re a futures exchange and a clearing house. We have 30% of all electric power futures and $40B of open interest. What does an exchange do? We help companies mitigate price risk, credit risk, and liquidity risk,” Cusenza said. He went on to say that, like electricity, trucking capacity moves in a network made up of nodes and pathways with geographic and seasonal issues, and that providers of the commodity can’t store it in the way that grain can be siloed as farmers wait for more attractive prices. Kingston asked Cusenza about the likely mix of traders in a freight futures market and the proportion of participants with exposure to the physical market versus financial traders or speculators. “Physical traders—that’s where everything starts,” Cusenza said. “We’re talking about people exposed to the price risk. Those entities are trying to manage price risk and get to a fixed prices. The electricity market is 60% physical, 40% is financial,” Cusenza said, adding that freight futures will probably be similar. Cusenza believes that the exchange will start with people looking and observing, initially. “But the need is there—it will happen,” he said. Fuller pointed out a reason that may force some transportation providers to get involved in the market. “Asset-based carriers’ boards have told me they think they may have a fiduciary responsibility to hedge,” said Fuller.